Inspector Lynley investigates the London end of an ever more darkly disturbing case, with Barbara Havers and Winston Nkata looking behind the peaceful facade of country life to discover a twisted world of desire and deceit. The suicide of William Goldacre is devastating to those left behind. But what was the cause of his tragedy and how far might the consequences reach? Is there a link between the young man’s leap from a Dorset cliff and a horrific poisoning in Cambridge? Following various career-threatening misdemeanours, Detective Sergeant Barbara Havers is desperate to redeem herself. So when a past encounter with bestselling feminist writer Clare Abbott and her pushy personal assistant Caroline Goldacre gives her a connection to the Cambridge murder, Barbara begs DI Thomas Lynley to let her pursue the crime. 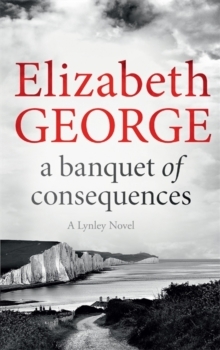 Full of shocks, intensity and suspense from first page to last, A Banquet of Consequences reveals both Lynley and Havers under pressure, and author Elizabeth George writing at the very height of her exceptional powers.